I have to admit I was a bit skeptical about attending the ‘Beauty of Play’ conference in Staffordshire England. The theme was ‘The Dark Side of Play’. It was held at a remote (to me) village manor. 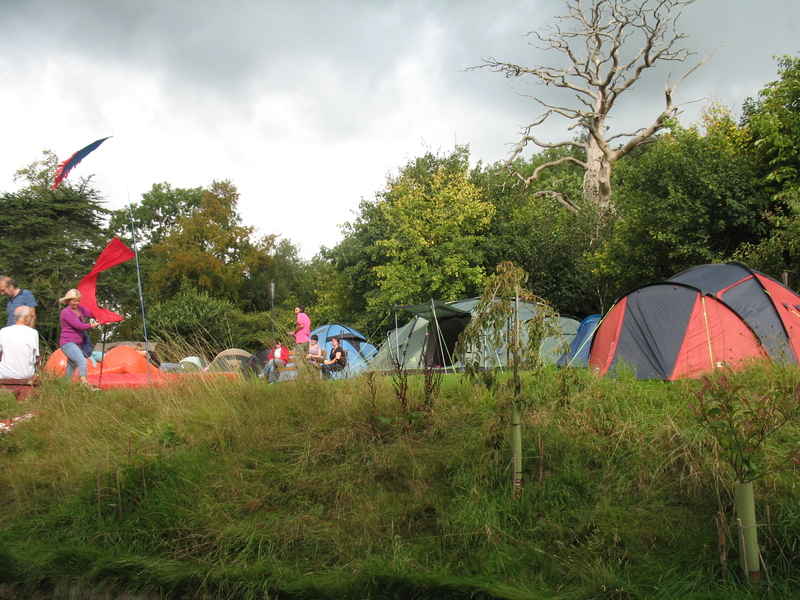 Participants were encouraged to camp under canvas (tents) on the grounds. And, of course, I knew no one else who was going. It turned out to be the perfect way to begin my Sabbatical adventure here in the UK. The conference workshops were illuminating. The people I met were passionate about the importance of play and committed to ensuring children had play opportunities. And I got to play with fire! I arrived on Friday afternoon at 4 PM. Perry Else, the stellar conference leader greeted me warmly – even though I was three hours early! – and showed me around the grounds. I offered to pitch in and help set up and was turned over to his daughter Millie who was in charge of food preparation. After washing dishes and dicing some spices and veggies, I helped Sue put up decorations. She made beautiful wicker tree sculptures which added to the magic of the conference. Just as I was feeling special about being so helpful, I read the fine print on some of the conference materials, and saw that people were expected to pitch in and help out! There were even sign-up sheets on the cupboard doors. It dawned on me that this kind of work is grown-up play. Just as child’s play encourages children to communicate, this kind of team work encourages adults to communicate. I have no doubt that some of the best conversations over the weekend happened in the kitchen. I also think that making sure everyone took turns doing the dishes is a great way to make people feel included and added to the openness of the conference. When people work together on a common goal, they trust each other a bit more. The first official conference activity was dinner. At dinner I met a play leader who gave me the names and numbers of people to call in London, a couple of play workers from Belfast, a Welsh woman pursuing her master’s degree in Play (who knew it even existed! ), and a storyteller. We had some riveting conversations. We talked about how adults insert themselves into children’s play too often, chatted about how children learn to develop relationships through play, and discussed the ranges different generations had to play in. Grandparents of today’s children got to play within a six-mile radius of home. Parents of today’s children could play in a two-mile radius, and today’s children have a 70-foot radius. Alarming how small the physical world has become for our children. After dinner, we were welcomed to the conference and introduced to the conference theme. We were invited to participate in an activity, ‘Gnomes in the Woods’, which involved hiding behind trees in the woods behind the manor house, or to relax and have tea or other beverages in the sitting room. I chickened out of the woods activity at the last minute and went to bed early that night. I wanted to be ready to play the next day! On Saturday, there were three sessions of workshops, and each session had three workshops to choose from. Before each session we gathered together and the workshop leaders told us about each of their workshops. This was a brilliant idea as it brought the description on paper to life and gave more details about what each session would accomplish. The workshops ranged from ‘Dark Matters’, ‘Disturborama!’, and ‘Children’s Sexual Play – Natural or Dark’ to ‘We Don’t Play Like That Here’ and ‘Feel the Fear and Do it Anyway’. Because Fairytale Town is based on rhymes and literature, I chose all the story-oriented workshops. The workshop ‘If I Was A Monster’ asked us to look back to our own childhoods, identify what we were frightened of, and playfully bring it to life as a mask, puppet or statue. 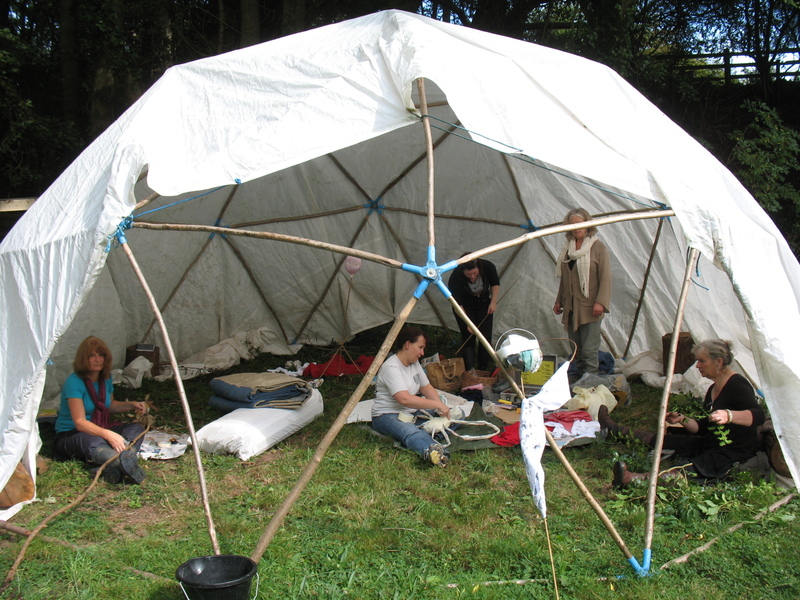 The workshop, led by Maggie Fearn, was held under a canvas (tent) in the clearing. We had access to all kinds of materials and tools, and were encouraged to go into the woods and forage for items as well. 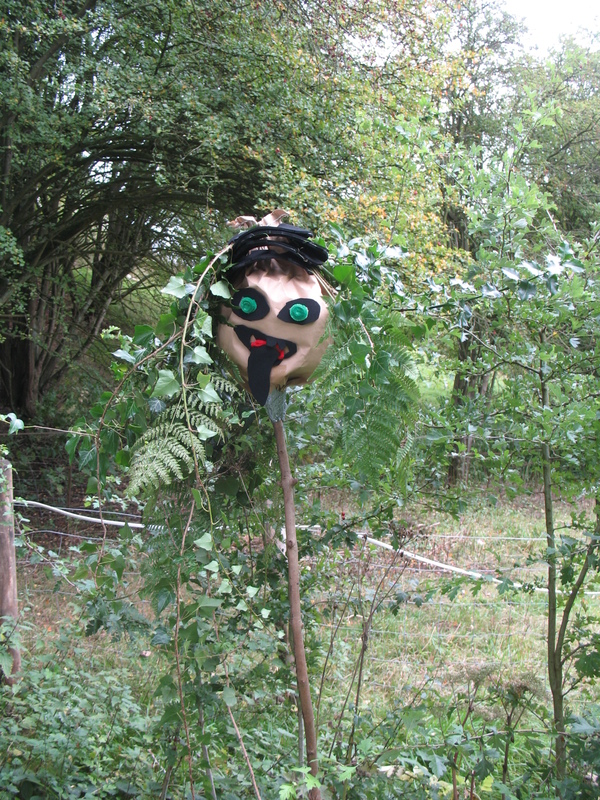 After a walk in the woods, I decided to create a puppet representing death. 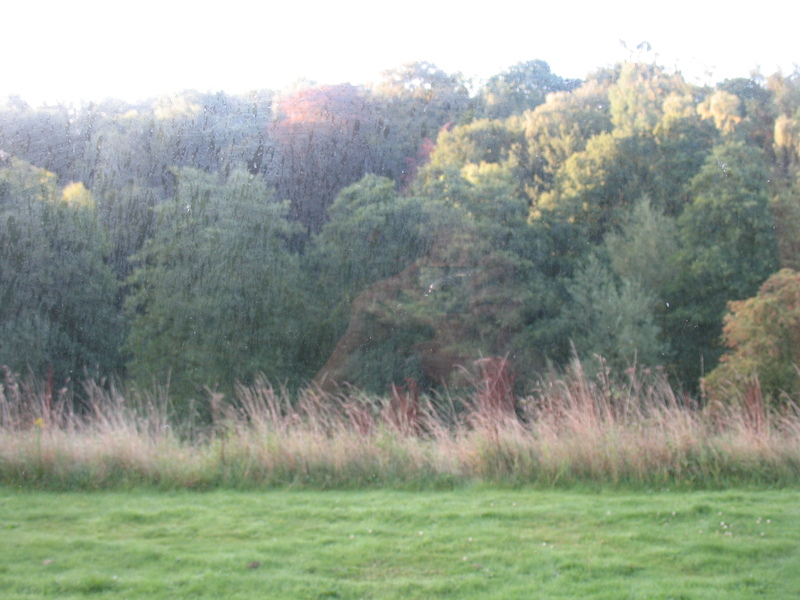 I gathered up dead leaves, sticks, seedpods and branches and brought them back to the clearing. As I began to make my paper bag puppet, I noticed lady bugs, spiders, worms and other creepy crawlies – there was a lot of life in those dead things! Maybe death wasn’t so scary at all. My cohorts made wonderful three-dimensional monsters. While mine was the size of, well, a paper bag, theirs were life-sized or larger. One represented The Slender Man – a monster whose lips were sewn shut. The others created flying monsters, witches with two faces, and shadow men. We each told about the fears our monsters represented and discussed the dark ways children may play when they were fearful. We then decided to burn our fears in the bon fire later that night. We were sure it would be cleansing. The next workshop I attended was titled ‘Baba Yaga and other Crones’. Jane Flood, a talented storyteller, told a Baba Yaga story and then we discussed the prevalence of crone characters in children’s literature. It seems cultures from all over the globe have the archetypal character of the crone. And there doesn’t seem to be a male corollary. Yes, there are wizards and sorcerers, princes and kings, but nothing quite like a crone. Why is that we wondered. And why do children like being scared by stories? Is it the adrenaline rush? Or is it that they like being reassured that all is well at the end, or knowing the bad guys (or gals in this case) get their just rewards? We made no judgment, just wondered and discussed… and it was riveting. My final workshop of the day was called ‘The Living Book’. Participants were encouraged to write a one-page book, complete with title and author, which told about their life or a chapter in their life. In this case, the books were asked to be about play. Those who didn’t write a book were readers. The readers got to check out a book, read it, and then interview the author (ie, the book) and interview or challenge them directly about their book. This workshop was based on a worldwide project called The Human Library. People from all walks of life write their books, and they are checked out by readers and challenged. Single mothers on the dole, ‘toughs’, and overweight alcoholics are examples of the types of books (ie, people) that could be checked out and interviewed or challenged. It is a way for people to hear directly from individuals whose ideas or lifestyles they don’t understand and get a sense of where they are coming from and why they do what they do in a non-threatening environment. An interesting concept. During our session I learned that there are politics in the world of play. Like every other profession or industry, not everyone in the play profession plays well with others! Saturday night was the bonfire. After a marvelous dinner, everyone gathered around the fire and we sang songs and told jokes. Those of us who wanted to burned our Monsters. 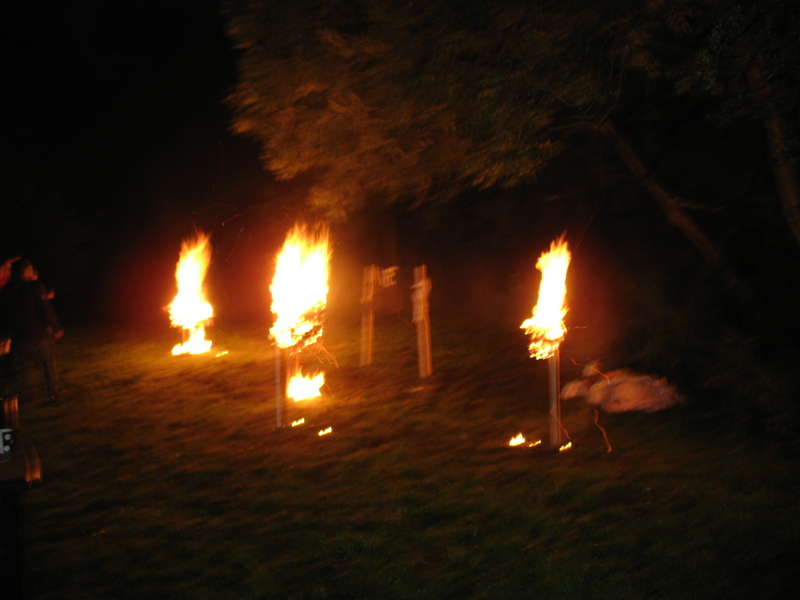 One of the workshops had created fire sculptures and they lit those as well. Then we saw the young man twirling balls of fire! Everyone who wanted a turn at spinning the fire balls got one. It’s all in the wrists! 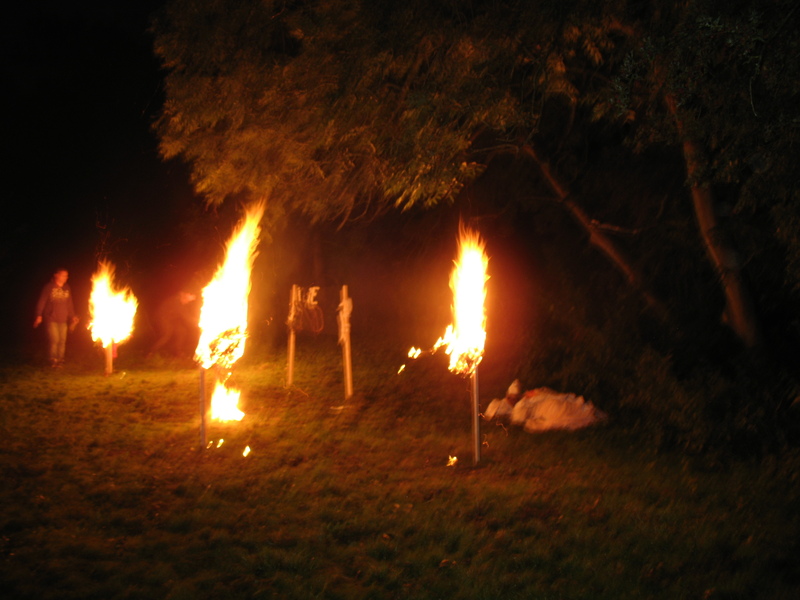 The fire balls were essentially big thick wicks that hung on a chain. You wove the chain between your fingers and then spun the fireballs as fast as you could. I took one for each hand. It was thrilling to be in the middle of it. The sight of the fire spinning so close, and the sound it made as it sped past your ears was incredible. I had a hard time going to sleep that night due to the sensory overload! After all the workshops wrapped up we met as a group, gave thanks for the wonderful weekend, and said our goodbyes. I left with friends and contacts, a greater awareness of the world of play in the UK, and – should the opportunity ever come my way again – the ability to juggle fire! More for me – no, that’s not true. But not your soul, at that I’ll stop.